Planning to start the blog and all set to generate the best content possible for your blog? Well, it’s certainly the key ingredient for the success of any blog. But then no matter how best quality content you generate the fact remains that till the time people know about its existence, there are minimal chances of the attaining desired success. What else is the smart way to spread the word? Does my question sound lame enough to be asked by the fellow bloggers who already are masters in their field. Here, I am talking in detail regarding the essentials steps/tips to be followed that ensure success. Online marketing is exactly what I am talking about. To be precise, there are lot many marketing tactics that are followed these days but one such tactic which is often ignored or sometimes underestimated is the ‘press release’. For all those who consider using press release as a promotional tactic for their blog surely know how useful it is while on the other hand there are lot many blog owners who simply forget about, underestimate or don’t even know about the existence of such kind of tactic. Wish to know about the advantages, sources and other relevant details about press release as far as blogging is concerned? Let’s discuss it in detail. Press Release has its own advantages as far as blogging is concerned. It is a PR announcement that ensures publicity. A well written press release can help you reach and attain the desired results. The very first advantage of Press Release is that it’s orginal news. You don’t have to re write the content from another blog or website. With press release you can be the first on the scene. With press release you can keep tabs on local companies and their press releases that can help you generate lot many good ideas. Also, it is a cost-effective way for publicity. It can help drive traffic to the websites. Now a days, not too much effort is required to search press releases. Heck, company blogs, Facebook, Twitter,Google Plus and lot many other social networking platforms are useful in this case. Also, there are specialized online press release distribution services like Business Wire and PRNewswire The best is that you subscribe to their RSS feeds and keep yourself updated on new developments. PRWeb, PRLeap, WebWire, PRFree, 24-7 Press Release, PRZoom, The Open Press, OpenPR are few other online press release services worth checking out. Google News can help you a great deal in catching press releases as they are caught by the Google spider. 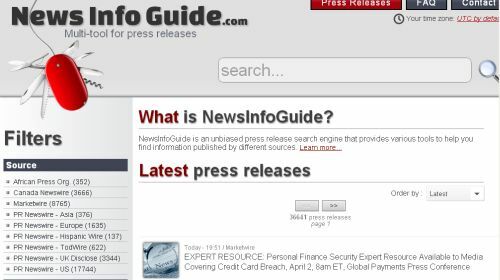 NewsInfoGuide is an unbiased press release search engine that provides different tools to help you find information published by different sources. 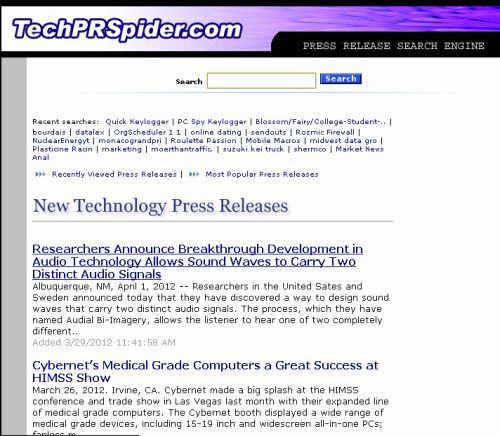 TechPRSpider is a press release search engine that focuses tech world and good number of tech related press releases each day. 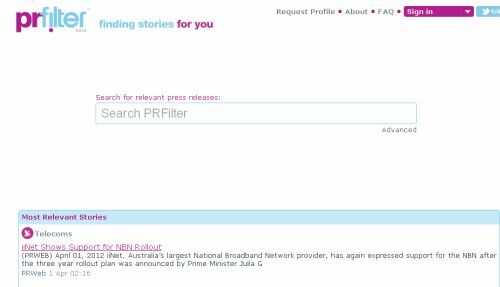 PR Filter sources the latest press releases from the main paid newswires and selected company news feeds. All you got to do is sign-in and build a personalized profile and start searching. Search can be customized by date and location if you desire to do so. On personal note, press release is a wonderful tool that all you bloggers out there should certainly use to avail the maximum benefits. Do you share the same thoughts? Let us know by posting the comment.